These tasty treats are a TOUCHDOWN! Perfectly festive for tailgating season. Make brownies according to package directions. Line pan with foil and leave 2 inches of foil above pan. This will ensure an easy removal of brownies from pan. Once brownies are cooled, lift from pan. 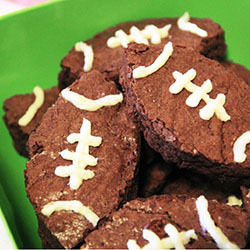 Use a football cookie cutter, 2-3.5 inches, to cut brownie into football shapes. Pipe on the decorative laces with white icing. Here are ten tailgating tips to make you a tailgating champ. 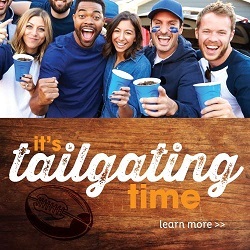 Then check out our awesome sales on our weekly ad to save big for your tailgates. Foods that can be eaten with your hands work best for tailgating. Think chicken, tacos, hamburgers, pulled-pork sandwiches, brats, kebabs, burritos . . . the list could go on and on. Regardless, simple, delicious foods allow you to focus on fun and be less concerned with complicated recipes. If you tailgate often, develop a checklist and laminate it. (Lamination will protect it from rain, snow, beverages and tears of opposing fans.) Or, use one of many checklist apps to ensure you never forget a much-needed item during your parking-lot party. You’re about to sit in a potentially sun-filled stadium packed with people on a chair that may or may not be comfortable. Sit in style pre game by packing portable seating and some shade. Camp chairs come in all shapes and sizes and most fit easily in your trunk. Canopies are easy to set up and simple to store. Plus, you can almost certainly find them in your team colors. Perform pre-game prep. Chop, slice, and assemble whatever you can beforehand. Store all of your food in waterproof, plastic bags or disposable plasticware. Both allow for maximum storage usage in your coolers. The more you pack in disposable containers, the less you’ll have to lug home or clean. When possible, use several smaller containers, rather than one large one, so you can take only as much as you need out of the cooler and keep the rest cold. Make it portable. Assemble materials in containers that are easy to carry. Smart tailgaters gather items in containers like toolboxes or storage bins. Condiments and utensils can be stored in empty six-pack containers. Coolers are important. Use at least two—one for food, one for drinks. Food safety is important, especially outside. Have a cold food cooler and a drink cooler. Drink coolers will be opened more frequently, so separate coolers allow food to stay cold longer. Instead of using bags of ice, use frozen water bottles. The bottles will make less mess in the cooler and you’ll have perfectly chilled drinks as they thaw. Keep it hot. When food needs to be kept warm, turn a cooler into a hotbox. Warm bricks in the oven, wrap them in foil and place in a cooler lined with wet towels. This will keep your food warm for 2-3 hours. Keep it short. Don’t let food sit out for more than two hours. If it’s really hot outside, (over 90 degrees) don’t let food sit out for more than an hour. Don’t hesitate to rely on your teammates. 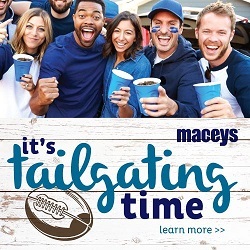 Our store can be an important part of your tailgating tribe. With meat and cheese trays, fresh-cut fruit and veggies, deliciously portable desserts and more, we have all the solutions you need to celebrate another successful season. Here are ten tailgating tips to make you a tailgating champ. Grab some chips, make this dip, gather family & friends and you are set for a good time. 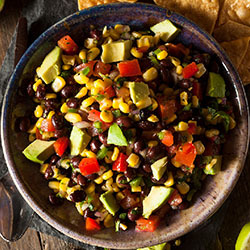 In large bowl, mix together corn, onion, black beans and black eyed peas. Gently fold in tomatoes, avocados and cilantro. Set aside. In a small bowl, mix together olive oil, vinegar, lime juice,sugar, salt, pepper and garlic powder with a whisk until combined. Pour dressing over corn, black bean mixture and toss to coat completely. Serve immediately or refrigerate until ready to serve. Be sure to toss right before serving.